It’s nearly showtime: my third lab lit novel Cat Zero is about to be published! After a several-month delay due to issues of US distribution, I am pleased to confirm an official publication date of Tuesday 5 June! 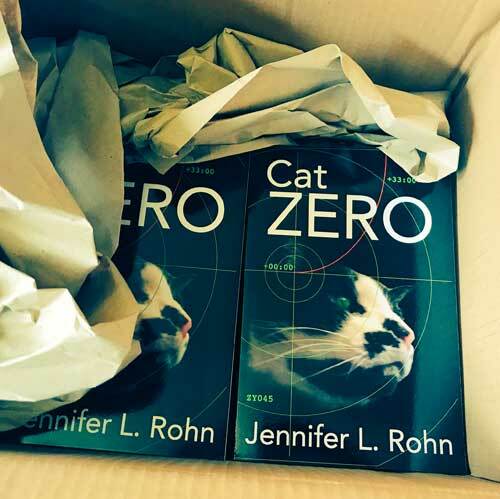 Set in present-day England, Cat Zero relates the tale of female virologist (Artie) who has to join forces with sexist mathematician (Simon) to solve a mysterious cat plague that might be more sinister than it first appears. The novel is a light-hearted thriller/whodunnit/romance/drama set firmly in the lab lit genre, jam-packed with scientists doing their science as an integral part of the plot. In fact, it’s probably the most science-y of all of my books. My only frustration with what has otherwise been a painless process of editing and production is UK Amazon, which hasn’t responded to requests to upload the correct, current information about the book. So don’t be put off by that £18.50 price tag: the paperback price should be £9.99 (and Kindle is £3.99). The US Amazon site has the correct information. Completely coincidentally, the publication date nicely coincides with several other geeky/sciencey/literary events I’m involved with in the coming fortnight, all of which are in London. On Wednesday 6th June I will be speaking at London’s PubSci – seven years after being the guest speaker at their launch event. This time I’ll be delivering a new talk I’ve just started airing: Boffins, Beards, and B-Movies: An illustrated story of science stereotypes from Socrates to Sci-fi. Packed with examples and film clips, it’s a fun exploration of the portrayal of scientists in fiction, with a more serious message about how those stereotypes can actually impair the ability of scientists to be effective messengers about all the important and crucial work that science does for humanity. Join us upstairs at the Old King’s Head, near London Bridge station. Doors open at 6pm for a 7pm start and as usual the event is free, but there will be a whip-round to cover costs. This month marks ten years since the launch of Fiction Lab at the Royal Institution, the world’s first monthly book group dedicated to lab lit fiction. It’s been a real pleasure presiding over this group for a decade. To celebrate, we’re throwing a special informal public event in the Ri Library on 11th June to discuss the relationship between science and literature over drinks (cash bar). Joining me on the panel will be award-winning author Philip Ball, novelist and astrophysicist Pippa Goldschmidt and novelist and astronomer Stuart Clark, all of whom have been featured guests of honour at Fiction Lab over the years. In addition, we are pleased to welcome on the panel Stephen McGann, an actor, author and science communicator who’s currently starring as Dr Turner in the BBC hit series Call The Midwife. Starting at 7 PM, this event is free to attend, although spaces are limited, and you can reserve your place here. I’ll be one of the panellists in this 13th June event at Waterstone’s on Tottenham Court Road. From their blurb: Virtual Futures presents a panel discussion, and a series of short-story readings, on using near-future fiction to foster transformative conversations between scientists and other audiences. By imagining possible futures, near-future fiction has the capacity to seize on the science and technology currently researched in laboratory environments and take it just far enough that it can provoke audiences to think on impending potential implications for society. How can science fiction be used to create a self-reflexive capacity in scientists? How can fiction help communicate scientific research to the wider public? How can encounters between the arts, humanities, social sciences, and hard sciences and engineering be fostered? As part of the underpinning project, three authors (not me) interacted with scientists at King’s College London and incorporated their work into short stories – a great idea. The event starts at 6 PM for a 6.30 start – tickets can be purchased here for £6. I’ll have books to sell and sign at all of these events, so please come along to one if you can and say hello! Here’s a spotlight on me and the novel that my lovely publishers, Bitingduck Press, sponsored in Publisher’s Weekly.